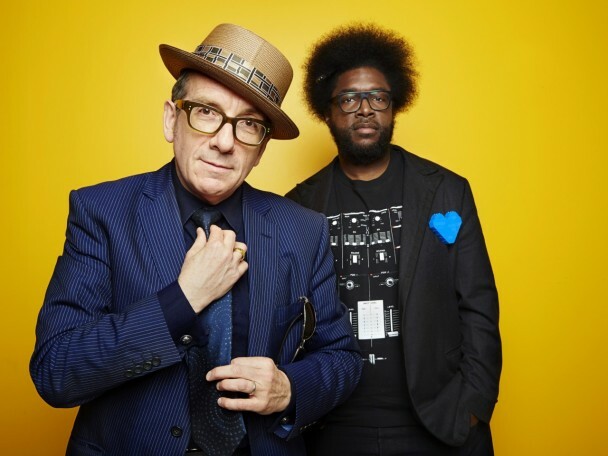 There’s a great essay over at Stereogum by Chris Deville about the collaboration between Elvis Costello and The Roots, Wise Up Ghost. “The first thing to understand about Wise Up Ghost is that it isn’t a vanity project,” Deville writes. “Yes, the new LP, released yesterday on Blue Note, is a full-length collaboration between Elvis Costello and the Roots. And yes, full-length collaborations between well-known artists sometimes end up as mere historical curiosities (Jay-Z and R. Kelly’sBest Of Both Worlds comes to mind) rather than blockbuster team-ups (Jay-Z and Kanye West’s Watch The Throne comes to mind). But Questo, Costello, and company seem to have put their all into this album, and the results are favorable. It might be a lark, but it’s an exceedingly pleasant lark. For the rest of the piece, head over to Stereogum.